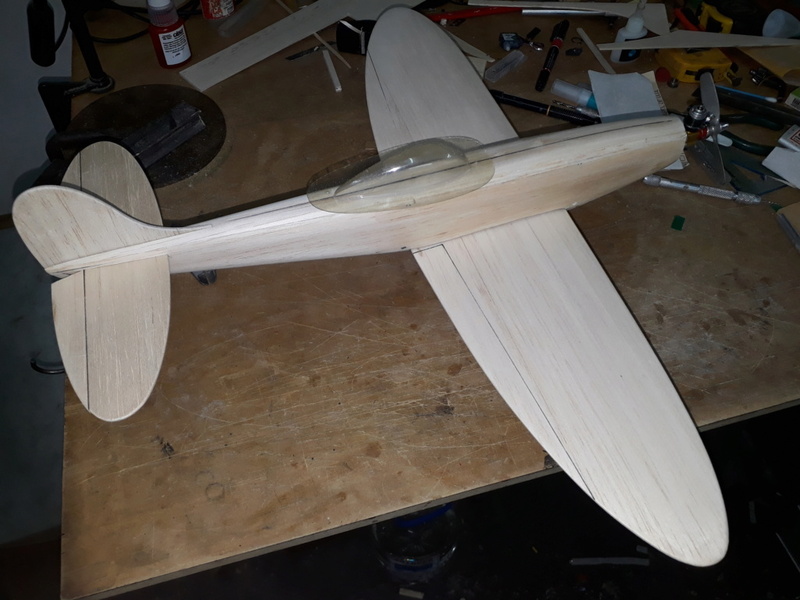 I have decided to manufacture a model for this Cox .010 rc. I have chatted with Brad who has a lot of experience with his small models, so I drew some lines and finally I achieved this model. The name ?? ...: Piyurin .010, this is a nickname that I sometimes use for some street dogs, that show a lot of affection, have great skills and are very friendly, simply, it is in short words a nickname that born of the affection of those small creatures that provide joy. I await your opinions here! I hope you like this design ... here we go with the PIYURIN .010 !! Like always, this is a beautiful plane being born in your hands, Mauricio. 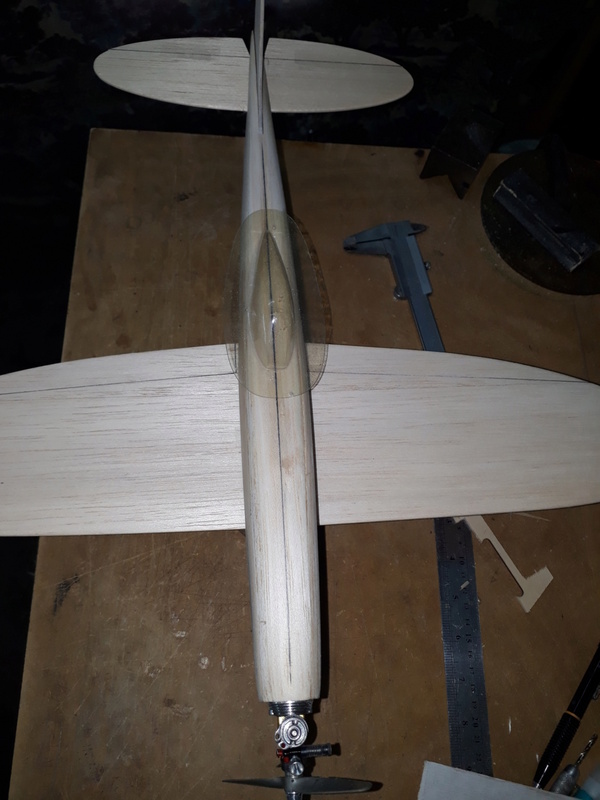 I see that all components, even the fuselage formers are made of balsa so the ready-to-fly weight will be low. 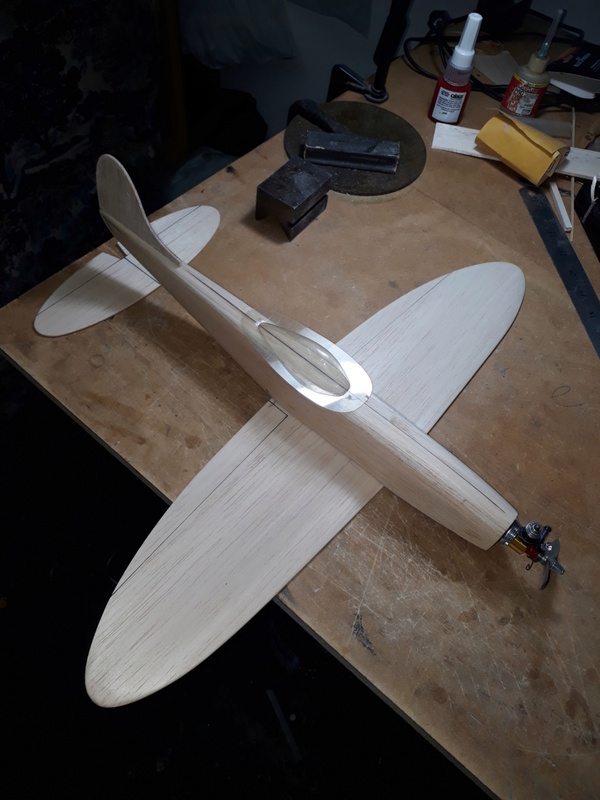 Remember to fuel-proof the engine cowl area and the fuel tank compartment well, because these small planes easily get the unwanted, additional weight from castor soaking into the fuselage front. My Roaring 20 powered by a Tee Dee 010 weighs 190 grams now, and before I rebuilt the old one, that weighed near 240 grams because of the lack of sufficient fuel proofing. 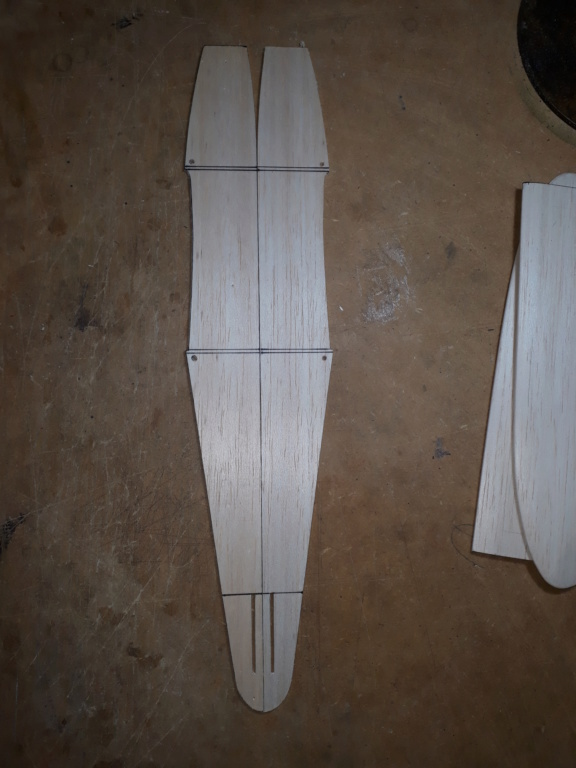 Will you add any strengthening elements to the wing like a carbon strip embedded/glued in as a main spar? 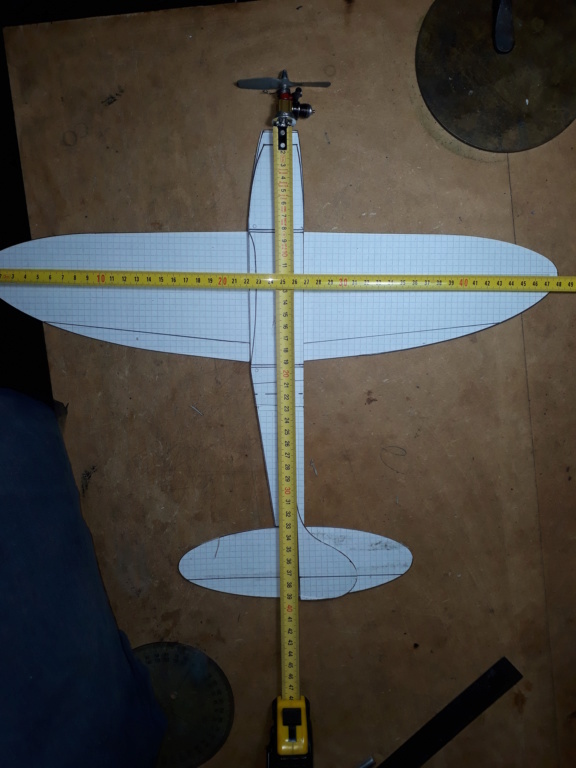 I would think of a 5x1 mm carbon strip that easily sinks into the wing top or bottom, without changing the airfoil profile. 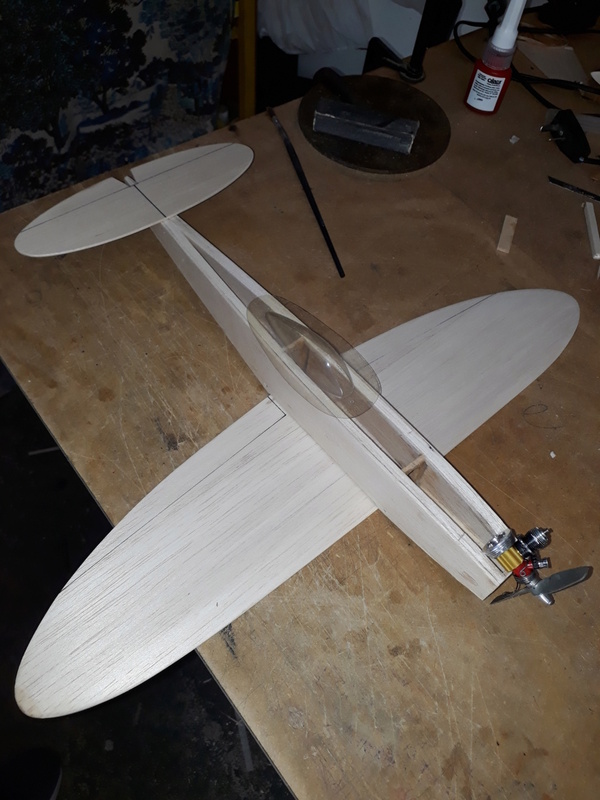 Also, as a precautionary measure - if I cannot add a carbon strip or round carbon tube or bar to the leading edge - I often soak the balsa leading and trailing edges in thin CA glue so as to make them stiff enough to resist hard landings on high-grass/weed fields..though I saw that the field where you fly has a nicely manicured lawn so no need to worry about occasionally dented leading edges. I am looking forward to seeing further details. What is the empty weight with engine? 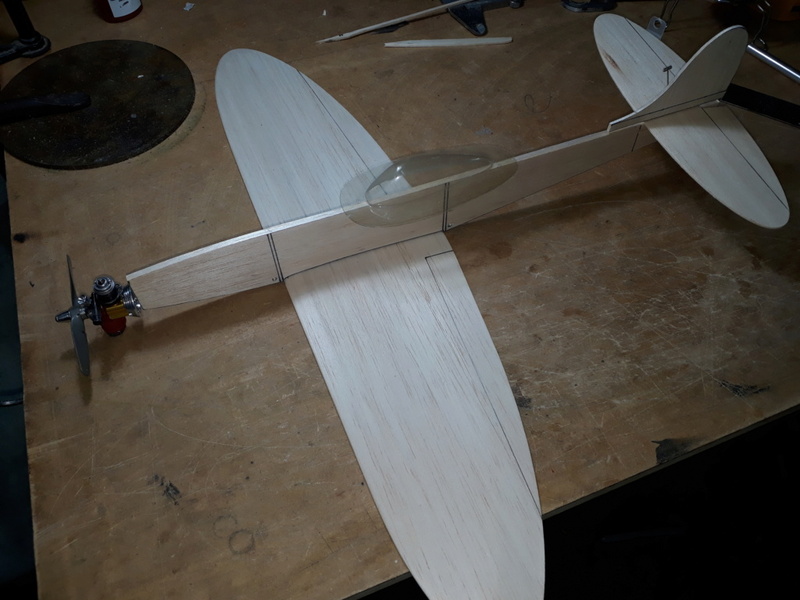 You can not have the ailerons so close to the fuselage if you are going to hold the wing down with rubber bands. 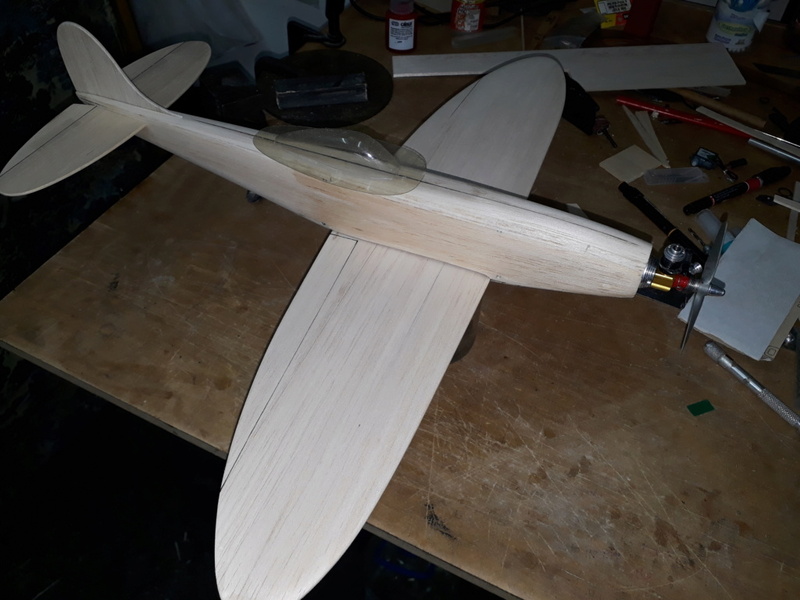 to help protect the balsa. Thanks Andras and Brad, I take your advice into account! The weight of the model as well as this is 60 grs without cabin and 62 grs with cabin. Wov, this is really light. 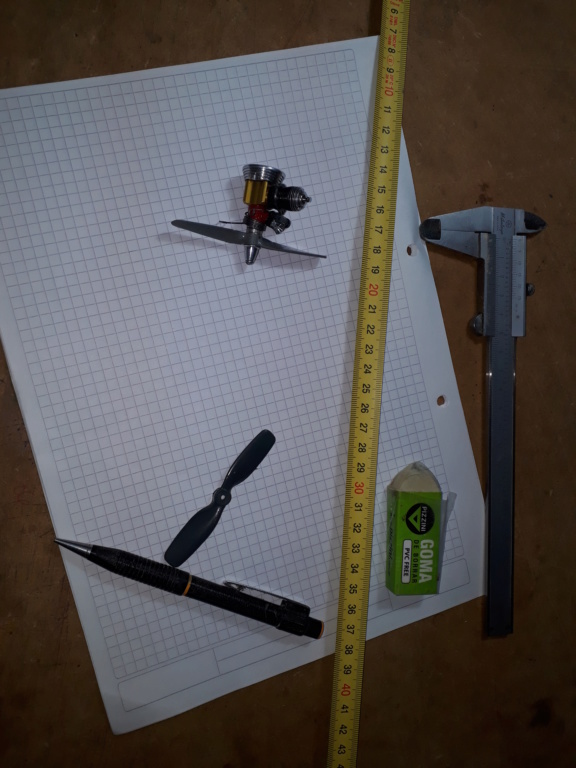 added an engine of 17 grams or so, plus fuel, battery, servos and receiver, you may end up below 130 grams all up weight? 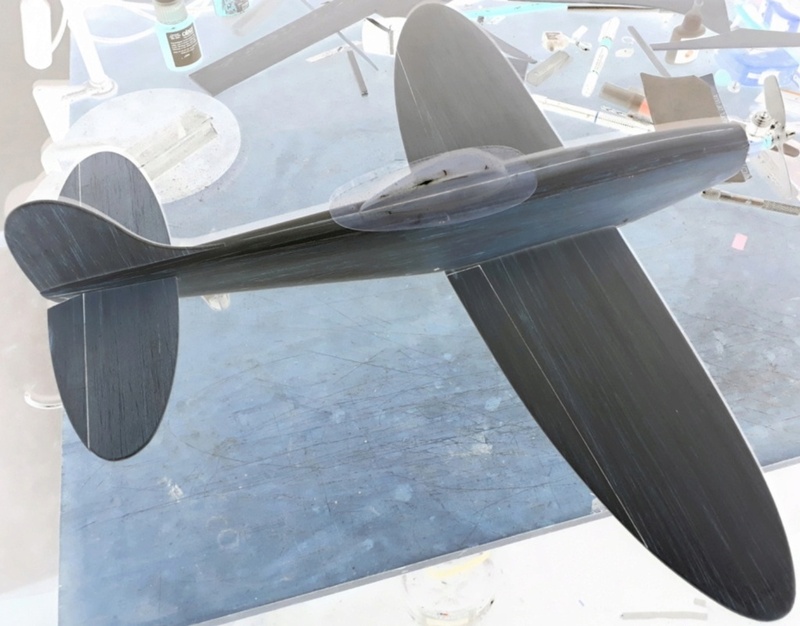 Andras, the engine is included, do not take it off, that is, the weight that marks the scale includes the engine Cox .010 r / c.
Of agreement friend, the motor + propeller + acceleration ring + rear plate in alloy, weighs 19 grs. 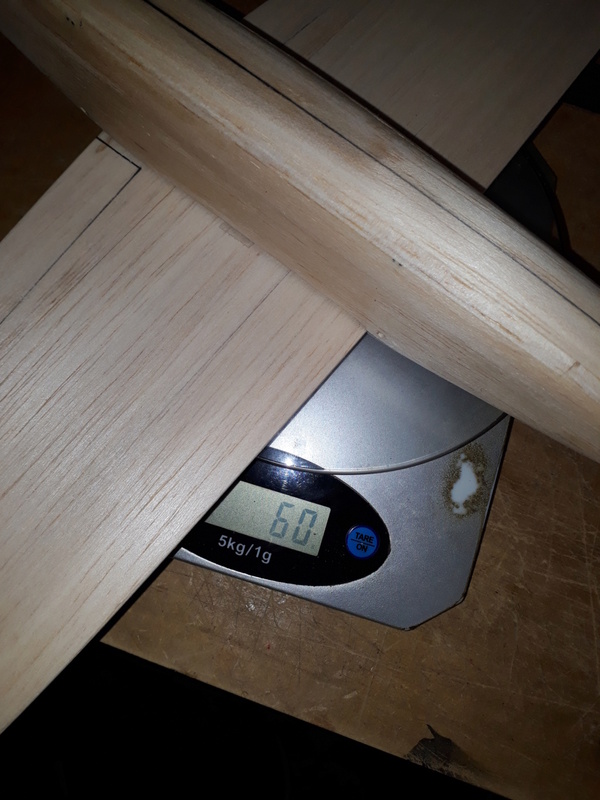 That is to say that 62 grs - 19 grs = the model in wood alone and cabin weighs: 43 grs. Ok so you are at 2.19 oz less radio gear, fuel tank, covering and push rods. Is this one getting a landing gear? 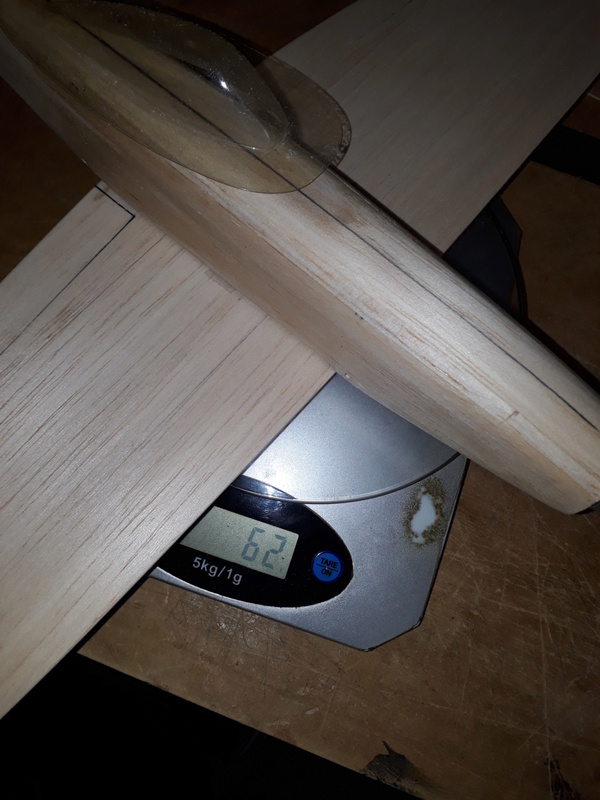 2ch / 2.2oz RTF / 15.5in span 28 Sq. In. wing. If it's true ... 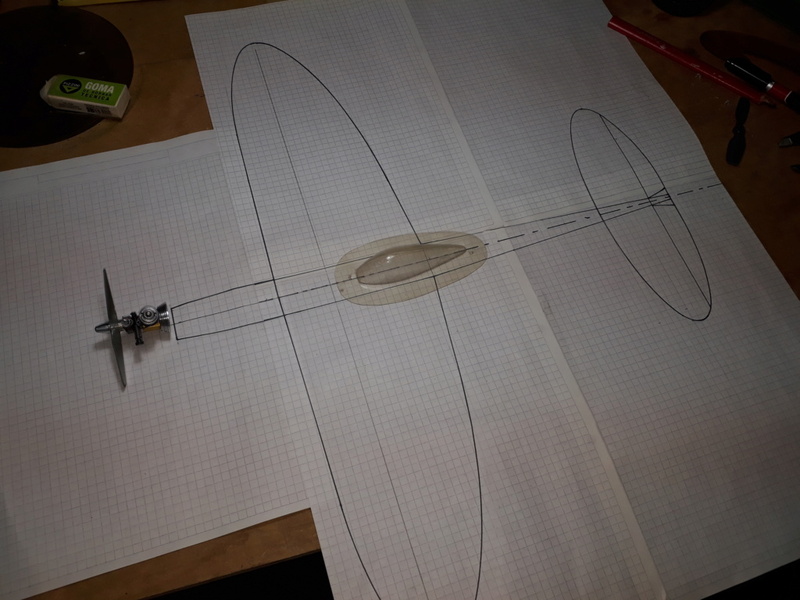 I never made an elliptical wing, we'll see how it behaves! 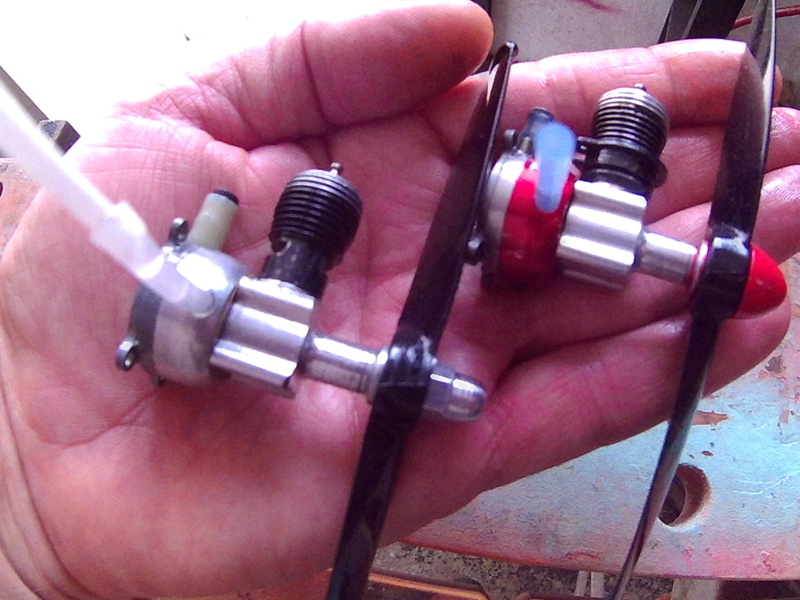 1/2A Nut wrote: Ok so you are at 2.19 oz less radio gear, fuel tank, covering and push rods. All these data are very interesting ... thanks for sharing! oh !!! ... I like Brad ... but there goes the Pee Wee .020 ... and then make relaxed flights! Way to go Brad! 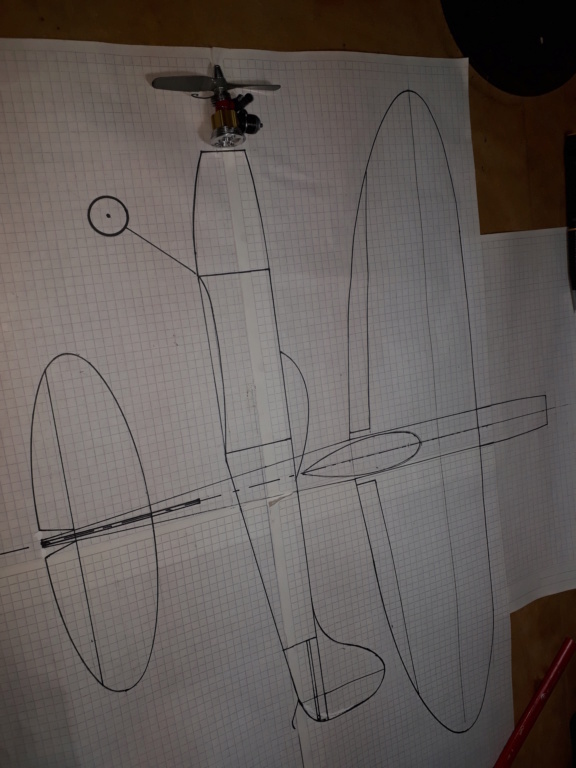 My experience with my Skorch copied from your first Skorch with ply rolled fuselage was that the flyability depended very much on how accurately the ply fuselage with its wing saddle and horizontal stab saddle cutouts was rolled so as to make the wing and stab sit parallel..I am sure you guys (Mauricio included) can make it nice and accurate...mine, well, left something to desire after I finished the rolling on a pool cue.. but it is way stronger and even lighter with its curved skin than reinforced, rectangular cross sectioned balsa fuselages. Thank you gents and for the thumbs up points Mauricio! Yes something easy to fly and land. If with a Pee Wee case will be using a prototype backplate. Will use a better NV and high flow intake Killer Pee Wee! 1/2A Nut wrote: Thank you gents and for the thumbs up points Mauricio! I've seen Brad, who, in a project, take advantage of the air flow to raise the pressure of the fuel tank and thereby optimize the operation of the engine ... well, here I am experiencing the same way. 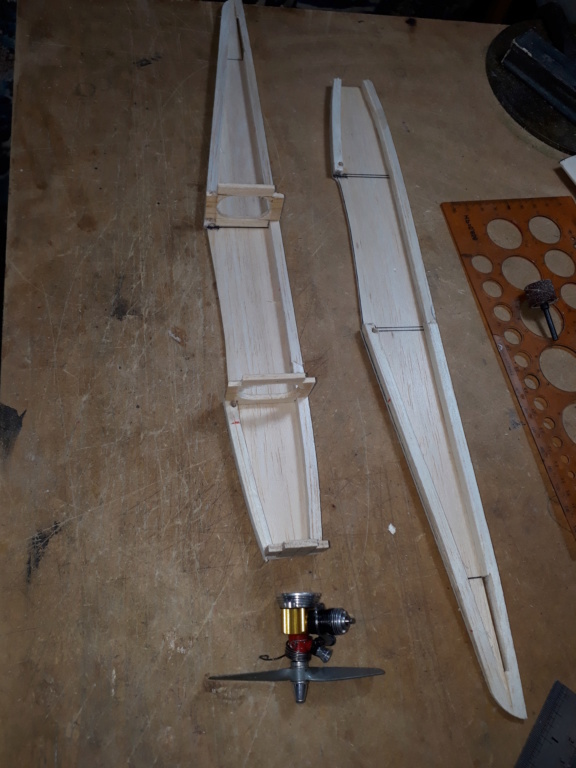 I have manufactured a venturi air collector, the same one that comes from the propeller and at the same time the air that the model takes in flight, we will see how it turns out! Hi Mauricio! I like your Piyurin .010! I also like the names' meaning. The lightweight is amazing! My latest 1/2A "profile-fuse" U-Control design weighs 5.15oz. (147gr.). I still need to paint the model yet.. The air-collector looks good! 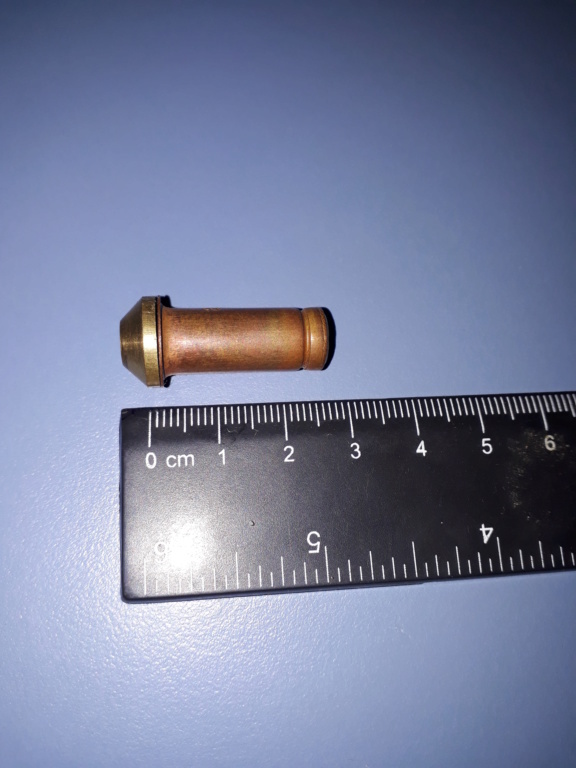 A small piece (25mm square?) of ladies Nylon-stocking material might work well to filter the air. Attach with a small rubber-band. 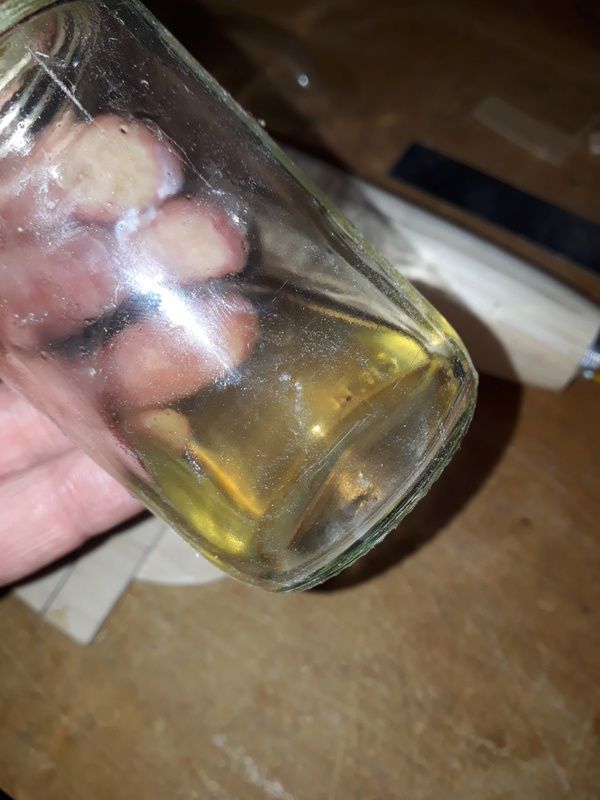 This will not work , stocking are not that pories ( there to keep you warm) i found this out the hard way on a 125 Yamamama dirt bike (( made it flood )) The collector looks Good Friend ! 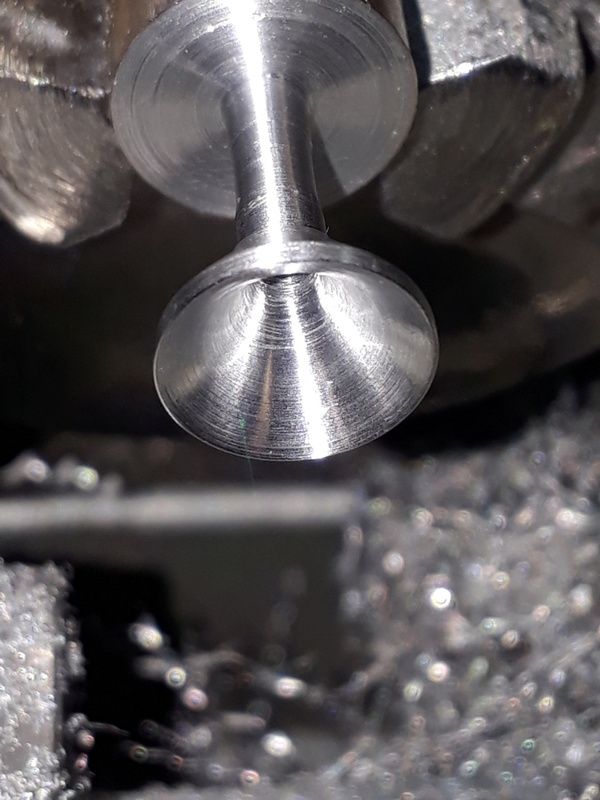 I see your putting the Lathe to work for you . roddie wrote: Hi Mauricio! I like your Piyurin .010! I also like the names' meaning. The lightweight is amazing! 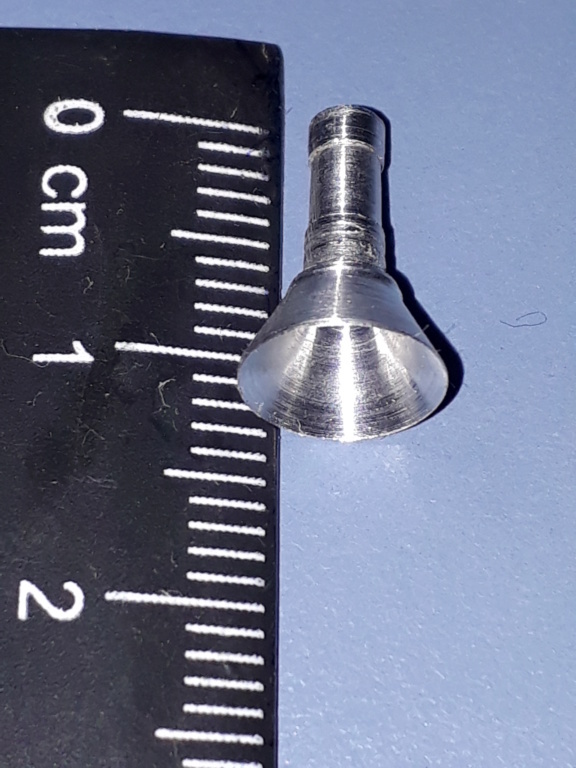 My latest 1/2A "profile-fuse" U-Control design weighs 5.15oz. (147gr.). I still need to paint the model yet..
Hello Roddie! ... Thank you very much for participating and leave your opinion here!...... we will see once finished when your total weight remains! I was thinking about how to make the maya or felt of the venturi that was responsible for taking air for the deposit and then remember: ...... a few days ago came the refrigeration technician to control my refrigerator, brought with it tools and accessories, a Once it was gone, clean the place and I find a piece on the floor ... 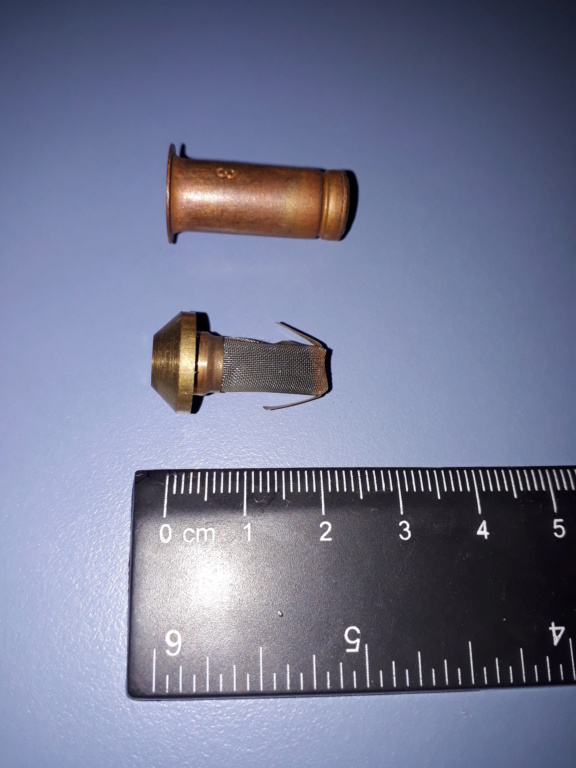 I did not know what it was, so I decided to see what it was ... to my surprise it was a felt, probably for gas refrigeration, when I opened it I found that it has a very fine mesh type COX, and ohhhh !! 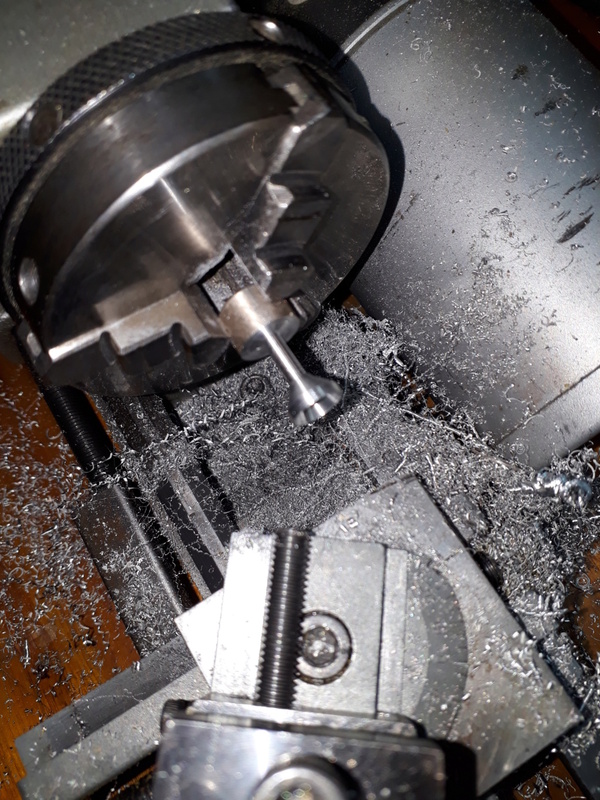 !, there is the solution, I will take that mesh and with that I will build the felt of my venturi !!!. 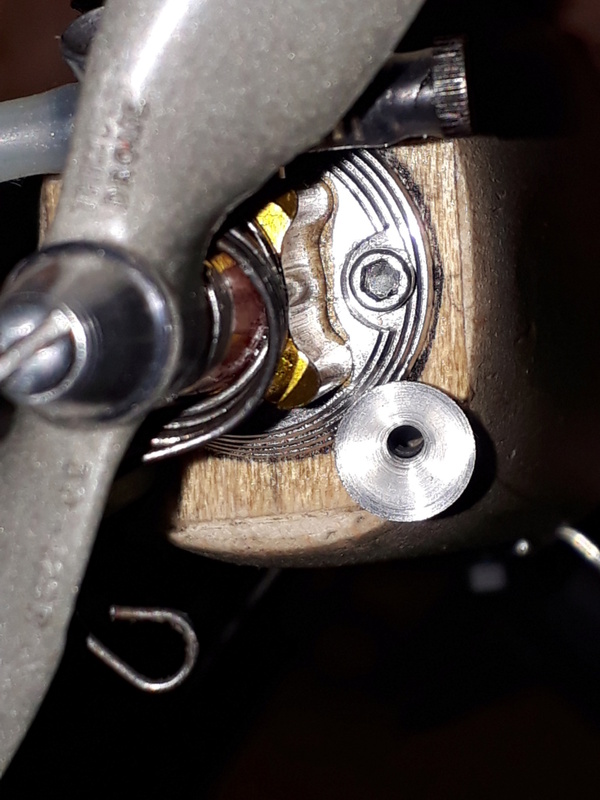 I will visit the technician and ask him what that piece is and possibly I will buy him some more, so I have felt for my engines !! Now you know ... here in this element you can also find a solution in your homes !! ... felt of cooling equipment!